In maybe the finish of the season, Alec Dean corralled a tipped, 36-yard Hail Mary from Christian Blessen as time expired to lift Shawnee Mission East to a 27-22 win over Olathe Northwest. Northwest appeared to have pulled off the upset for coach Chip Sherman against a Lancer program he coached the last four years. The Ravens pulled within 21-20 with 30 seconds left on a touchdown connection from Cole Dahlquist to Chase Gitlin. Sherman opted to go for the two-point conversion and the win and Gitlin hauled it in to give the Ravens a 22-21 lead before Dean’s heroics on the final play. Kellen Myers threw two touchdown passes as Manhattan topped Topeka Seaman 19-7. The Indians also scored on a safety and a field goal. Myers hit Winston Dimel on a 65-yard touchdown pass to open the scoring in the first quarter. Manhattan led 19-0 before Seaman’s Ryder Chaffee scored on a short run in the third quarter. Erin Gaither and Deron Thompson each rushed for touchdowns as Wichita Northwest doubled up Wichita East, 16-8. Thompson managed just 38 yards on 16 carries against the East defense. The Grizzlies won for the first time this season after consecutive losses to Kapaun Mount Carmel and Dodge City to open the season. Gardner-Edgerton scored 34 points in the second and third quarters combined to top Blue Valley Southwest, 48-17. Traevohn Wrench rushed 20 times for 221 yards and three scores to pace the Trailblazers. Quarterback Jared Hobby passed for 114 yards and two scores for Gardner-Edgerton. Great Bend rushed for more than 250 yards in holding off Garden City 28-25. The Panthers built a 21-17 lead by halftime thanks to a long touchdown run and a touchdown reception by Greg Burley. Jonathan Allende added a short scoring run for the Panthers. Allende finished with 90 yards on the ground on 38 carries. Burley was more efficient, taking his three carries for 89 yards. Greyson Tempel passed for 242 yards for Garden City, but was held to just eight rushing yards on eight attempts. Salina Central held off St. Thomas Aquinas 42-40 in a battle of two teams seeking their first win of the season. The Mustangs led 21-17 at halftime and extended that lead to 35-24 at the end of the third quarter. Aquinas held Central on fourth down in Saint’s territory and quickly scored to pull within 35-33. Aquinas initially converted the two-point conversion to tie the game, but it was called back by a penalty. Each team would add a touchdown, but the Mustangs held on for the two-point win. Central was led by Malik Veal who rushed for 154 yards and three touchdowns. Quarterback J.W. Maldaner added 158 yards rushing and a score. Mill Valley remained unbeaten with a 38-0 shutout of Basehor-Linwood on Friday night. Ty Bruce rushed for 129 yards and a touchdown and Nick Wilson added 105 yards and a score to pace the Jaguar offense. Basehor-Linwood could not produce positive net rushing yards on 38 attempts against the Mill Valley defense. KC Washington used a big night from junior Jaevon Williams to slip past Atchison, 24-20. Williams rushed for 198 yards and three touchdowns on 30 carries for the Wildcats. Marvin Bowens added 77 yards and a touchdown on the ground for Washington. Atchison was led by quarterback Tanner Huntington who completed 16 of 30 passes for 230 yards and three scores. The Redmen were held to just 24 rushing yards on 23 attempts. Sophomore Ian Rudzik rushed for 119 yards and three touchdowns as Ulysses outscored Colby 21-2 in the second half of a 52-16 win. Jorge Mendez kicked all seven PATs and added a 41-yard field goal in the second quarter for the Tigers. Wichita Trinity quarterback Matt Jones scored on a two-yard touchdown run in the second quarter and the Knight defense made it stand up in a 7-0 win over Cheney. Trinity’s Tyler Burns earned his 107 rushing yards on 23 carries. After leading Haven 27-21 at halftime, Hesston put the Wildcats away with 28 points in the third quarter en route to a 55-33 win. Senior running back Ryan Schadler rushed 15 times for 322 yards and five touchdowns to lead the Swathers. Quarterback Wyatt McKinney completed 9 of 16 passes for 104 yards and two scores. Schadler caught two of those passes totaling 25 yards and another touchdown. Bonner Springs scored 38 points in the first half in routing Bishop Ward, 41-13. Senior quarterback Jordan Jackson completed 11 of 19 pass attempts for 257 yards and two touchdowns to lead the Braves. Trevon Mason added 106 yards rushing and two touchdowns. Jonah Freese caught three passes for 116 yards on the night for Bonner Springs. LaDarrius Johnson rushed for 135 yards and three touchdowns as Coffeyville-Field Kindley beat former SEK League rival Iola 40-10. The Golden Tornado led 21-3 at halftime but added three touchdowns in the second half to pull away. Nathan Finley passed for 151 yards and a score for Coffeyville and Destin Downing added a pair of touchdown runs. 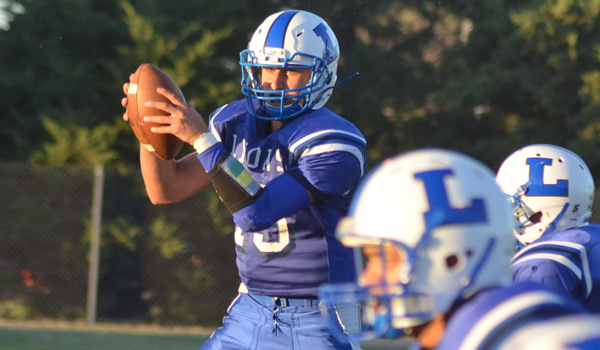 Lyons quarterback Ryan McClure continued his air assault on opposing defenses. The senior completed 22 of 36 pass attempts for 416 yards and four touchdowns in the Lions’ 40-28 win over Sterling. McClure has now passed for 914 yards in the first three games this season. Lyons is off to a 2-1 start under veteran coach James Johnston who came over from South Barber at the beginning of last season. Humboldt opened their new stadium with a 41-20 win over Tri-Valley League rival Neodesha. The Cubs broke through the new orange end zones first on a 27-yard touchdown pass from Alex Murrow to Jacob Carpenter. Humboldt led 20-6 at halftime and outscored the Blue Streaks 21-14 in the fourth quarter for the win. Caleb Vanatta led the Cubs with 105 yards rushing and four touchdowns. Murrow threw for 260 yards and a pair of touchdowns on the night. Cimarron remained unbeaten with a 46-14 win over Sublette. The Blue Jays led 46-0 after three quarters before the Larks got on the board. Cimarron’s Caleb Fischer passed for 332 yards and six touchdowns on the night. He connected with Christian Fischer six times for 229 yards and four scores. Brendan Giesick rushed for a touchdown and threw a touchdown pass for Sublette. Gabe Helton rushed for 127 yards and a key 77-yard touchdown as Galena used a big second half to top Frontenac, 28-14. The Raiders led 7-6 at the intermission before Helton’s big touchdown run. He also caught three passes for 95 yards and another score to help the Bulldogs remain unbeaten. Council Grove held off Chase County 27-20 to improve to 3-0 and keep pace with Lyndon in the Flint Hills League. The Braves led 7-0 at halftime thanks to a Lane Evans touchdown run. Council Grove extended their lead to 27-12 in the fourth quarter after Evans tacked on his second touchdown run of the night and Tanner Langvardt broke free for a long touchdown. Chase County would answer with a late touchdown of their own to pull the final margin within seven. Elkhart outscored Lakin 33-21 in the first half en route to a 47-35 win. Senior quarterback Alex Gomez passed for 447 yards and seven touchdowns on 17 of 31 attempts. Gomez also added 65 yards rushing on 15 carries. On the season, Gomez has thrown for 892 yards and 13 touchdowns. Gage McAtee rushed for 138 yards and two scores to pace Lakin. Wyatt Landenberger rushed for a pair of touchdowns as St. Francis shutout Stanton County, 28-0. With the loss, the Trojans have started the season 1-2 for the first time since 2009. St. Francis is vying for its first winning season since that same year when the Indians lost in the second round of the 2-1A playoffs. Bo Krueger rushed for three touchdowns and passed for two more as Olpe picked up a big 49-7 road win at Jefferson County North. Krueger hit Toby Smith on a pair of touchdown passes as the Eagles left little doubt they would get their first win on Friday night. Valley Heights used a 34-point second quarter to run past Onaga, 60-16. The Mustangs featured three running backs that rushed for more than 100 yards led by freshman Logan Woodyard’s 130 yards and a touchdown on eight carries. Senior Cole Maddox rushed for 102 yards and three scores, and Derek Trimble added 104 yards and a score. Gage Woodyard contributed three rushing touchdowns for Valley Heights. Michael Bliss led Onaga with 118 yards on the ground. South Central held off Pratt-Skyline 38-28 thanks to another big night from Stetson Underwood. The senior quarterback rushed 28 times for 175 yards and four scores to help the Timberwolves top the Thunderbirds. Cole Patterson scored three rushing touchdowns for Skyline. Solomon rushed for 537 yards in a 74-52 win over Wakefield. The Gorillas led 34-12 at halftime and the two teams each scored 40 points after halftime. Colton Shirack and Mason Demars each rushed for more than 200 yards for Solomon. Shirack rushed for 206 yards and a score, while Demars added 204 yards and four touchdowns. Mark Aylward rushed for 124 yards and two more scores for the Gorillas. Wakefield was led by quarterback Keenan Westerman who passed for 241 yards and a touchdown. West Elk scored in each quarter in winning a South Central Border League showdown over Udall. Sophomore running back Armando Gomez had another big night rushing for 177 yards and three touchdowns for the Patriots. Tristen Wilson added 115 yards passing and a touchdown to Paxton Noll. Dalton Loos led Udall with 132 yards rushing and two scores. Spearville led Fowler 52-8 at halftime and held on for a wild 80-54 win over the Goldbugs. Sophomore quarterback Nathan Stein rushed for 175 yards and four touchdowns on nine carries for the Lancers. Stein also passed for 96 yards and two scores. Freshman Luke Heskamp led Spearville with 220 yards and four scores on the ground as part of his 11 carries. In total, Spearville rushed for 561 yards on the night. Fowler quarterback Taylin Bird carried 25 times for 284 yards and four touchdowns. Luke Huelskamp added 133 yards and a touchdown for the Goldbugs. Chetopa scored 58 points in the first half in routing Pleasanton, 64-18. Derrick Cassell rushed for 247 yards and five touchdowns to head the Green Hornets. Junior quarterback Phillip Moses passed for 225 yards and three scores – all three of which went to Austen Sanders who caught seven balls for 216 yards. Argonia-Attica rallied for 14 points in the fourth quarter to top Norwich 44-32. Sophomore Alec McDaniel led the A&A Titans by passing for 166 yards and three touchdowns, and rushing for 93 yards and two more scores. Jacob Norris led Norwich by rushing for 214 yards and two scores, and throwing for 177 yards and three more scores. Lucas Lohrman caught eight passes for 136 yards and all three of Norris’ touchdowns. The Rolla Pirates blanked Goodwell (Okla.) 46-0 on Thursday night to remain unbeaten. Kyler Telford rushed eight times for 173 yards and four touchdowns to lead Rolla. Jaron Rusch completed all four of his pass attempts for 24 yards and two touchdowns. Northern Valley outscored Hill City 28-6 in the third quarter to pull away for a 56-22 win. Jordan Baird rushed for 167 yards and a score to lead the Huskies, while Phillip Bryant added 110 yards and a score. Quarterback Hunter Chandler rushed for 79 yards and four scores and passed for 71 yards and a touchdown. Hill City was led by Deric McKeever’s 159 rushing yards on 24 carries.